While there is no doubt the Apollo A7L spacesuit is an impressive engineering feat and a keg piece of hardware that protected astronauts from the harsh environment of space I am amazed about the fact that two special zippers kept the pressurised air within the suits and that Velcro was used to protect these zippers. Is anyone aware of any additional information on the engineering of these items and what testing, failures and failure rates were experienced during the development of these suits and if this information is available online somewhere? 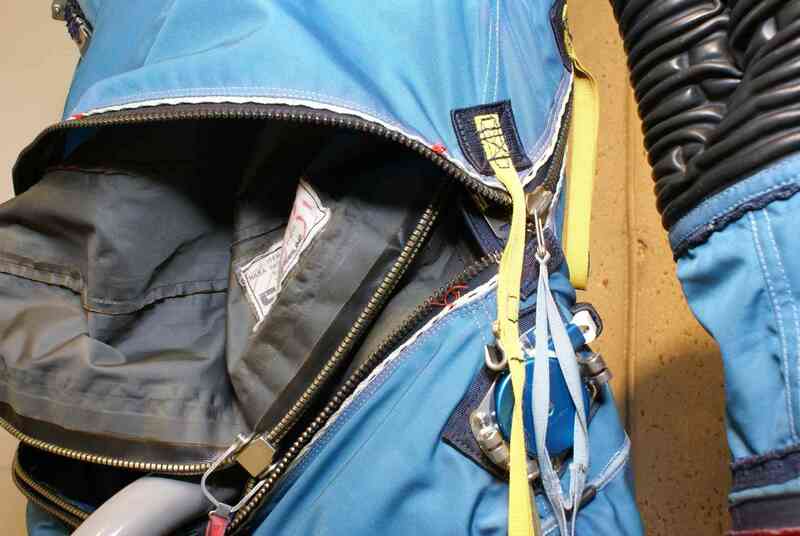 By my count 3 zips associated with the suit's pressure vessel. On ITMG: A protection (shutter) with a Velcro (Velcro) and snaps for fastening, opening the rear base of the neck to the crotch, and ending with a small zip from the crotch to the pubis protects the zipper of TSLA. 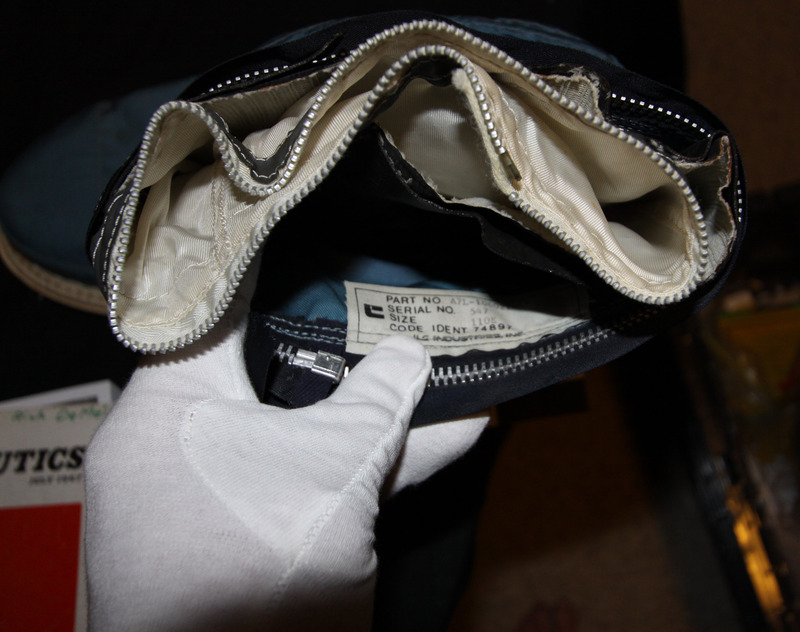 For A7LB suit (Apollo 15/17): Three zip, but — two zip are located on the restraint layer of the suit and are the only visible. 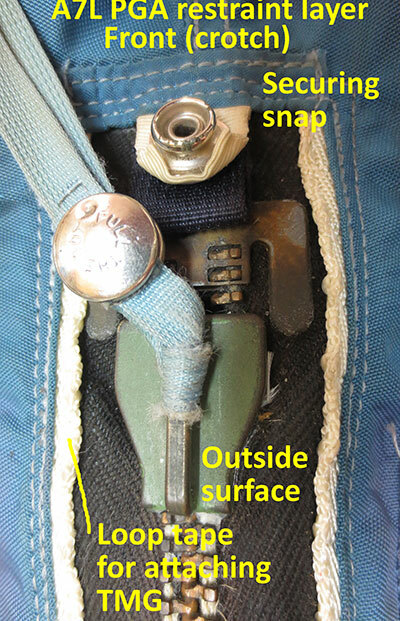 A third zip fastener, clicking this time over the entire length of the cover opening and located under the two preceding ones, which ensures the confinement of oxygen. Yep... pretty sure for the pressure (TLSA) layer there are 3 zippers required to maintain pressure integrity. Please, have you a photo you would show a diagram that it? Because the pictures that I have in my possession, I can not know where this third would zip! This is very interesting detail. Thank you for posting these photos. What air leakage rate and suit pressure would these withstand? 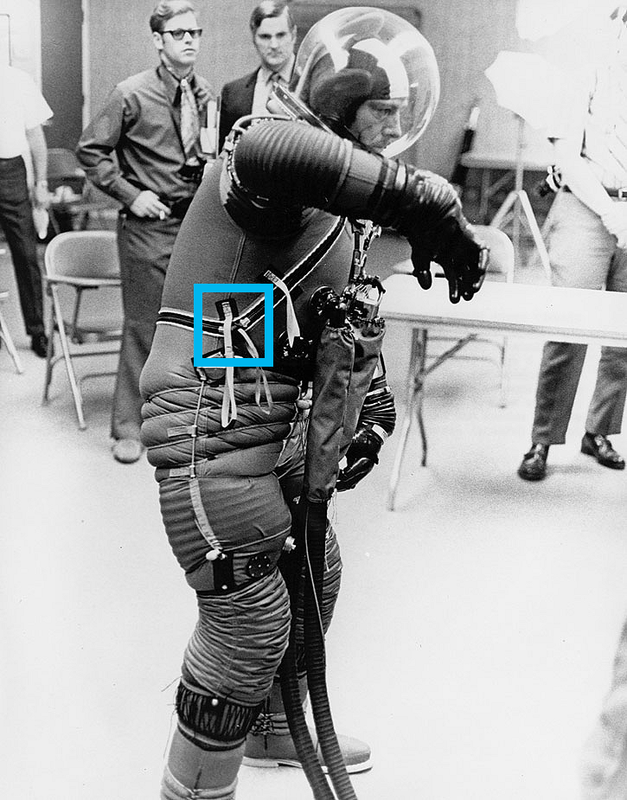 Ok, I am at a loss to understand how the suit could maintain pressure integrity relying on these zippers, the pressure garment zipper must be of a unique design and suit pressure must be relatively low to be able to maintain pressure. Ah YES, of course, the boot. I'm dumb. Ok, so it makes us 6 zip for A7L: 2 for TLSA (1 pressure and 1 restraint) and 2 every boot 1 pressure and 1 restraint). And 7 zip for A7LB: 3 TLSA (1 pressure and 2 restraint) and 2 every boot (1 pressure and 1 restraint). Thank SpaceAholic for the memory. The pressure inside the suit is equivalent to only 1/3 of the earth's pressure (that found at sea level, 1013.25 hPa). The residual leakage does not exceed 0.0315 lb/hr. Apollo 12 during flight: Before the first EVA, once closed and pressurized the spacesuit of Peter Conrad developed a leakage rate of 0.15 psi/minute and reached 0.25 psi/minute after the second EVA. Since the safety limit was set at 0.30 psi/minute, it would have been dangerous than a third EVA can be performed if it had been scheduled. Here is the link to the BFG zipper. The suits were built with the assumption of leakage, but all passed post-flight testing. I have to dig up the documents, but there was a published record of that. The original post was inquiring about the special pressure sealing zippers. Both the A7L and A7LB suits only used one pressure sealing zipper. 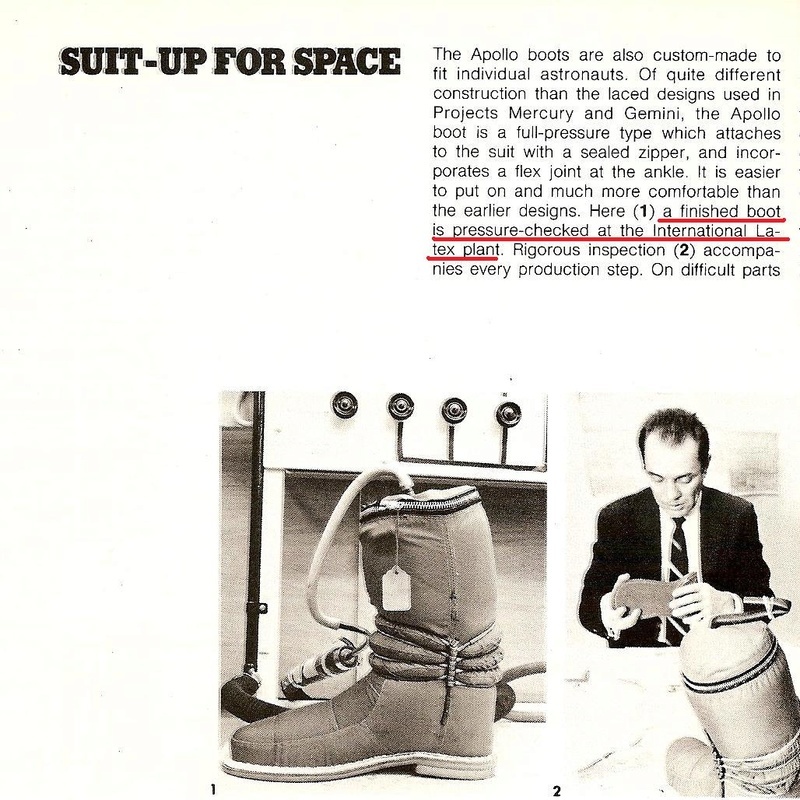 As a point of clarification, the Apollo suits (A7L and A7LB) did not have pressure sealing zippers at the boots. 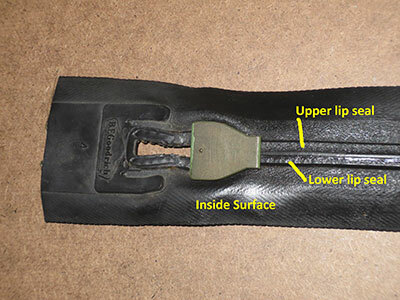 The zippers seen in the boot photos of earlier posts are regular non-sealing zippers in the restraint layer and in the inner comfort layer. The boot bladder was glued to the leg bladder and was not detachable. The A7L boots used loop tape and lacing cord to secure the boot restraint layer to the leg restraint layer. This was later changed to a zipper in the A7LB suit. Loop tape takes some time to lace up so zippers are a lot quicker for suit assembly. No pressure sealing zippers were needed or used at the boots. The A7L spacesuit had one BF Goodrich pressure sealing zipper which ran down the back of the suit and thru the crotch up to the lower abdomen. 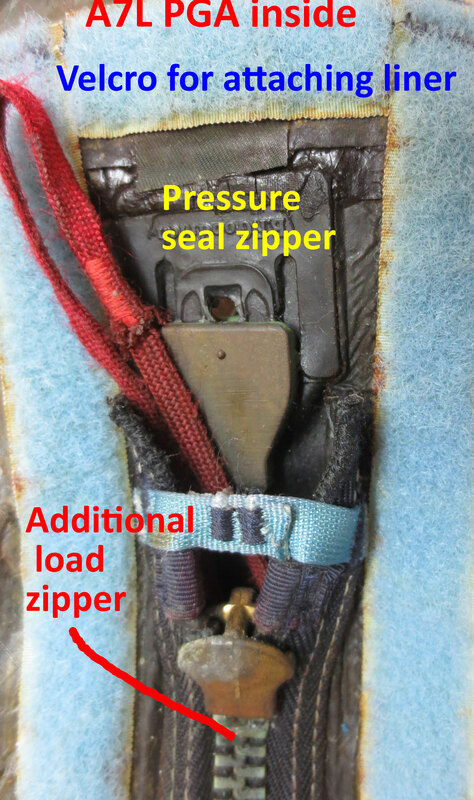 A separate regular heavy duty zipper was used over the pressure sealing zipper to help carry the pressure induced loads on the sealing zipper but was not part of the pressure sealing zipper. 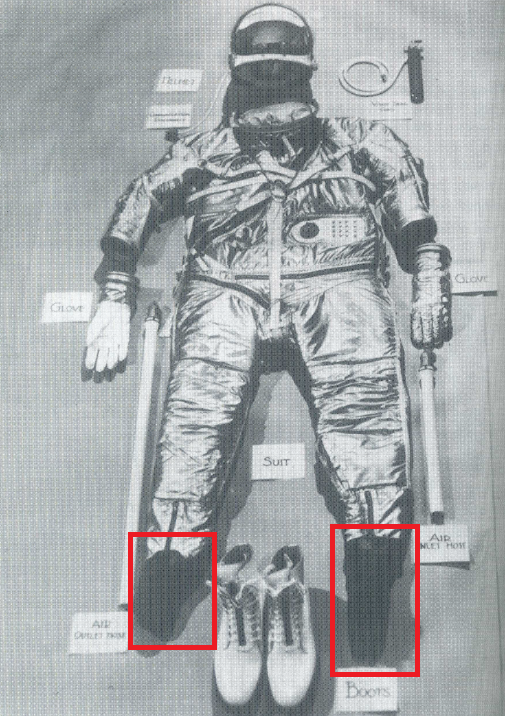 (On earlier suits, Mercury did not use the additional mechanical zipper over the pressure sealing zipper but the Gemini suit did). The A7LB suit used only one pressure sealing zipper as well. The pressure sealing zipper was a BDM/YKK type sealing zipper instead of a BF Goodrich sealing zipper. The pressure sealing zipper ran diagonally the front of the suit and wrapped around the rear of the suit at the waist line. The BDM/YKK style sealing zippers are more flexible and due to their design can seal better when the zipper is bent in a tight radius. The pressure bladder was not secured to the restraint layer around the zipper opening. This allowed the pressure zipper to roll over on its side to make the bend between the straight diagonal run down the front of the suit to the horizontal run around the back of the suit. (See the link to the A7LB picture in Apolloman's earlier post). 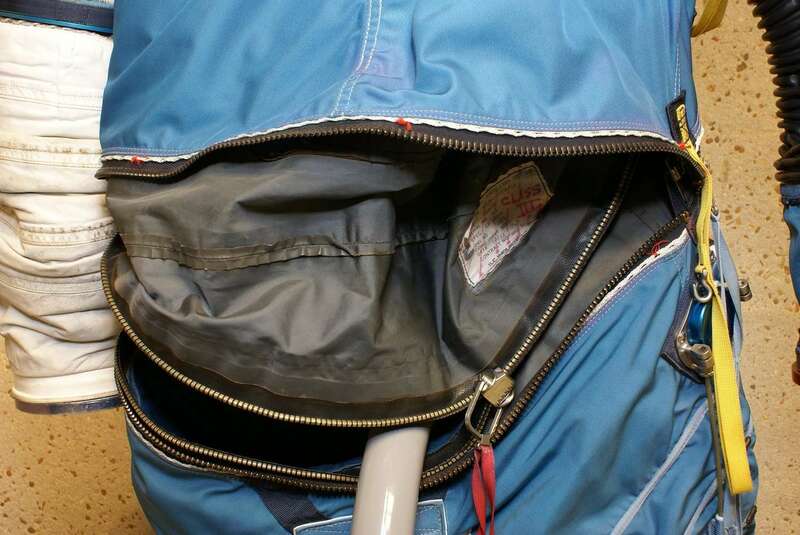 When closed, the pull tab on the pressure sealing zipper was at the wearers left side at the waist and completely hidden by the restraint zipper. 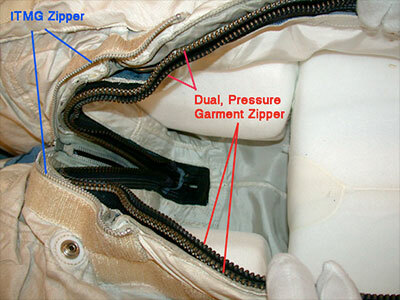 Two regular zippers are used in the restraint layer over the pressure sealing zipper. 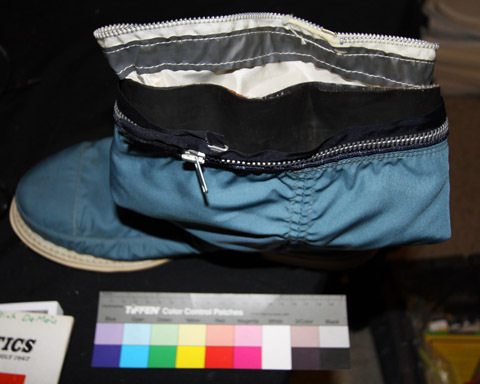 One regular zipper ran diagonally down the front of the suit to the waist and a second regular zipper ran around most of the circumference of the waist. The two regular zippers met at a rather complicated latching mechanism that locked the ends of the zipper pull tabs together. The use of other zippers and Velcro on the ITMG were unrelated to the pressure sealing of the suit. The ITMG provided thermal and ballistic protection to the pressure suit. The regular zippers and Velcro used on the ITMG was for securing and the ITMG to the suit and access to pockets, etc. As mentioned in the first post to this thread, the pressure sealing zipper is a unique item. The sealing zipper was first invented by the BF Goodrich Company in the 1940's for aircraft aileron gap seals, weather seals, pressure duct seals, and exposure suits. The earliest patent I have for the Goodrich sealing zipper, US2385816, was awarded Oct 2 1945 (filed March 4 1943). Over the years the design modified somewhat as indicated by the later patent referenced in Cathy in her previous post, and other patents were granted after that. But the basic principal remained the same of two wedge shaped lips forced together by the action of the zipper teeth locking together. The tricky part was sealing the end of the zipper where the pull tab ended up when the zipper was closed, and they came up with a clever design that used the inner surfaces of two flanges on the inner and outer surfaces of the slider pull tab to compress the rubber around the opening of the zipper. Wayne Galloway who worked with Russell Colley at BFG told me many years ago that the zippers used in the pressure suits were the heaviest of their line of zippers. Lighter weight ones were used on the exposure suits and aircraft components. BFG pressure sealing zippers were used in their line of high altitude pressure suits and and most soft spacesuits up through Apollo. Unfortunately BFG no longer makes the zippers, and no longer exists as a company. BF Goodrich lives on in name only thru tires made by the Michelin Co.
Current pressure suits use the BDM/YKK (New Zipper Co) style familiar to most as being used on scuba diving dry suits (and as used on the A7LB). The sealing mechanism of the BDM/YKK zipper is different than the BFG design and entails using a different type of zipper teeth to force together two up-turned edges of the rubber seal. The BFG pressure sealing zipper had a very low profile which was beneficial for sitting or laying on it. Whereas the YKK style zipper has a rather thick zipper section which sticks out from the suit fabric and is less comfortable to lie on. 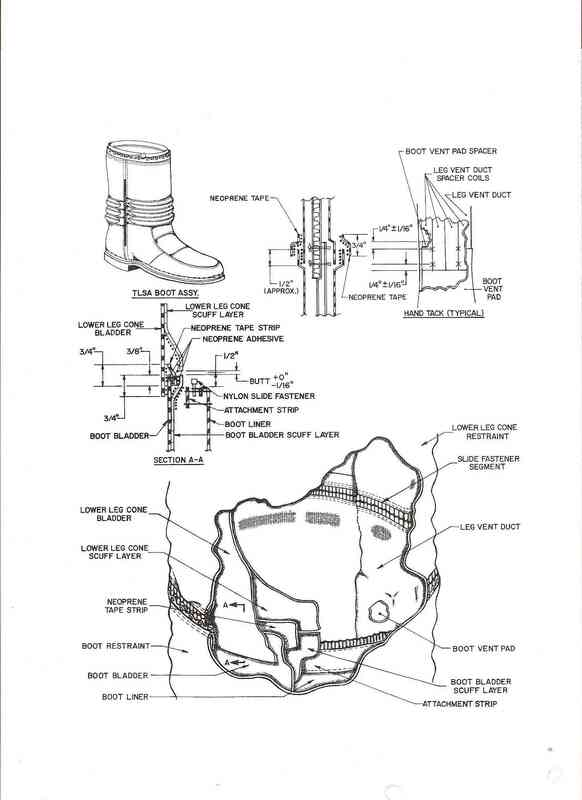 One last bit of trivia: The name "zipper" was coined by BFG when they came out with their line of rubber boots in 1923 that used the "separable fastener" as the zipper was called at the time. 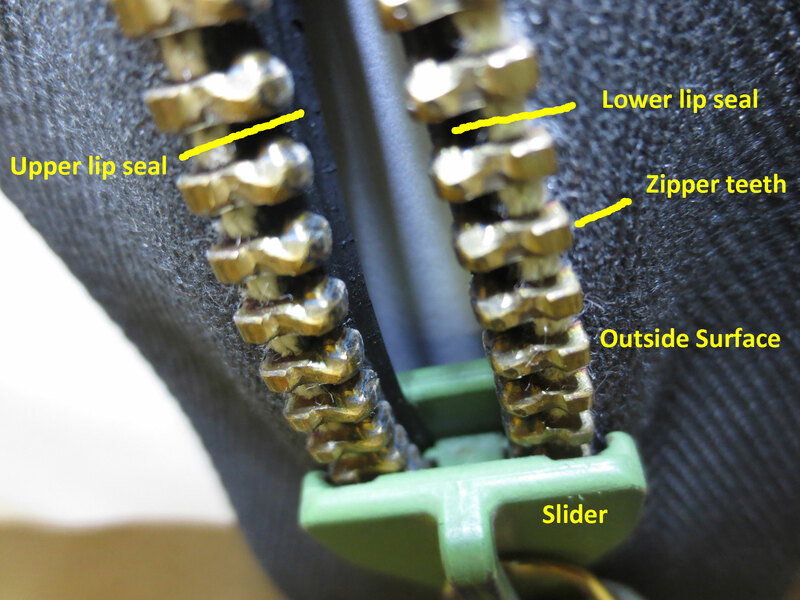 They wanted a name that implied fast action for putting the boots on and came up with "zipper" for the fastener. Thanks for the education ...I learned something! Thank you all who have responded to my post, your information has helped me understand this subject and has assisted me researching this subject further. By sharing this information and helping each other satisfy these curiosities the efforts of the whole Gemini, Mercury and Apollo programs helps to keep them alive. The information held within the cS universe will prove to be a great reference to future curious space nuts. This is one of the subjects that I have been curious about for years and hoped that my visit to the U.S. last month may have given me a chance to learn more about, in my travels I did not find any suits that were displayed to give an insight into this. All the suits on displayed are presented "zipped" up. I have also got a better insight into how the astronauts functioned with such low pressure within the suit. The deepest impression left on me after my visit was how brave these people were to undertake these missions. The fact NASA has disclosed so much information is fantastic and I hope that the private companies taking the reigns in spaceflight someday release similar information when it is no longer commercial in confidence information. If I understand correctly (sorry I'm french), the boot is presented by SpaceAholic none other than protection like a sock, bladder being bonded to the rest as for the Mercury spacesuit. 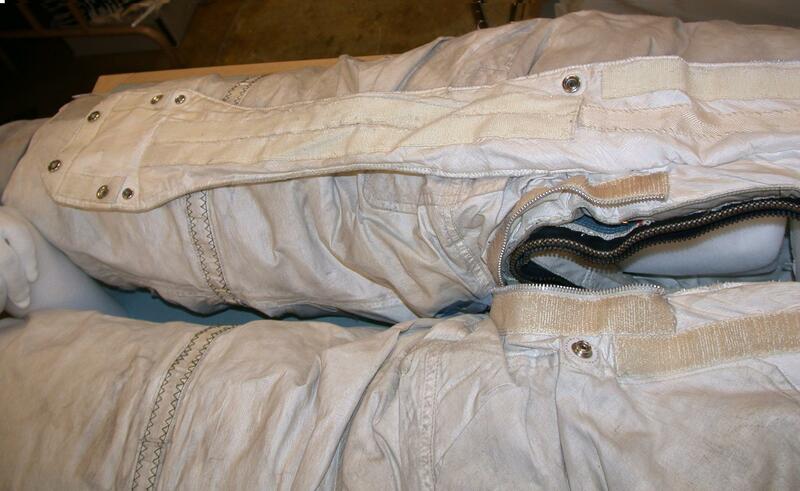 From my understanding, the Mercury suit was manufactured with the foot as part of the suit, acting as a bladder with the astronaut contained within the bladder. The boots were relatively standard boots, fitted to contain the bladder inside. When laced up the boot acted to restrain the lower part of the suit from ballooning out, without the boot the suit would extend and balloon out about the foot and its volume would expand. The astronaut wears a harness, similar to a parachute harness, to retain the suit volume. The Mercury gloves used a strap about the palm of the hand to also prevent the glove from ballooning about the hand. Later suits were improvements upon these designs. There were problems with the Gemini suit ballooning during EVA causing problems with astronauts returning to the seat and closing the hatch. The Apollo suit improved on this further. I do not have photographs of these but perhaps someone else can elaborate on this further. Here is a photo of the Apollo A7L boot parts. The inner most part is the comfort liner on the left side of the photo. This provides a smooth surface on the inside of the suit for the astronaut. It also holds the ventilation ducting that provides oxygen circulation in the suit. The rubber boot bladder is shown in the center of the photo and goes over the comfort liner. This is the part off the boot that holds the pressure. This part is similar in function to the foot bladder you highlighted in the image of the Mercury suit in your posting. 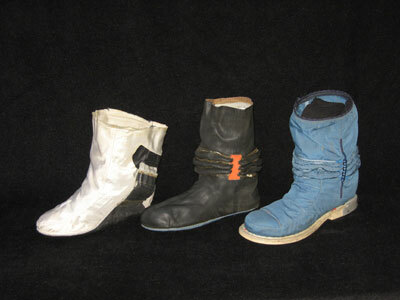 The blue fabric boot on the right side of the photo goes over the rubber foot and is the restraint boot which keeps the rubber bladder from ballooning when pressurized. The restraint layer of the suit is what gives the suit its shape and contains the mobility elements that enable the suit to move. You can see the convolutes and the restraint cable with ferrules that make up the ankle mobility joint. What is not shown is the ITMG layer that goes over the restraint boot. It is attached with lacing cord through the loop tape that runs around the edge of the boot were the boot is attached to the boot sole. Unless the pressure sock (black) no glue or off on demand (on schema: neoprene adhesive and neoprene strap) a bit like Velcro. I can email you a HD picture. Yes you have the assembly order correct. The vent duct ends into a vent pad on the bottom of the foot liner (white fabric). This is all sewn together as one unit. The pressure sock (black rubber) is lined on the inside with a soft white fabric which is bonded to the rubber during the manufacturing of the pressure sock. 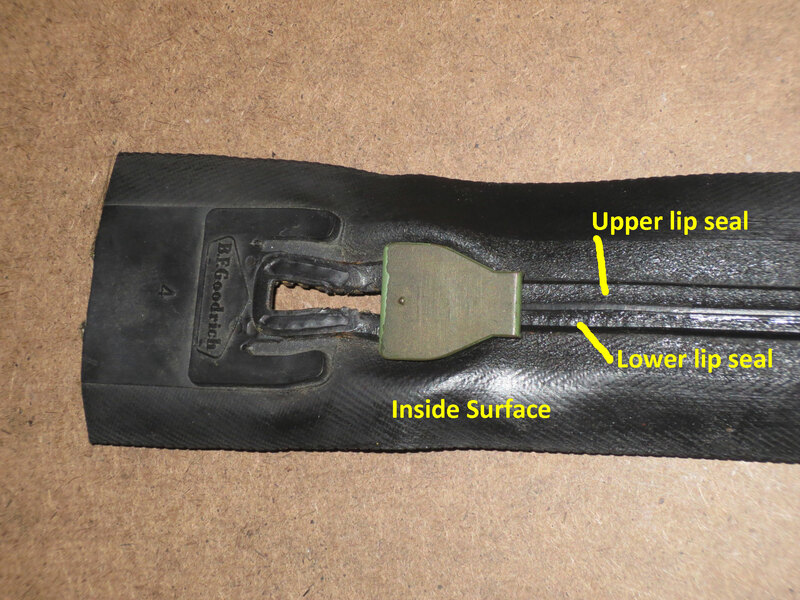 This is what is referred to as the scuff layer in the boot assembly diagram in your post. It helps prevent damage to the inside of the rubber pressure sock similar to flocking in a rubber glove. The black pressure sock has a layer of velcro on the bottom of the foot which holds the pressure sock in the blue restraint boot. The latest space history photo of the week is an excellent display of the suit pressure bladder and boots as discussed above. The tricky part was sealing the end of the zipper where the pull tab ended up when the zipper was closed, and they came up with a clever design that used the inner surfaces of two flanges on the inner and outer surfaces of the slider pull tab to compress the rubber around the opening of the zipper. Current pressure suits use the BDM/YKK (New Zipper Co) style familiar to most as being used on scuba diving dry suits (and as used on the A7LB). The sealing mechanism of the BDM/YKK zipper is different than the BFG design and entails using a different type of zipper teeth to force together two up-turned edges of the rubber seal. I do not understand how this zipper works. If I had one in my hands, I would probably found how the hell does this thing work, but I haven't. Is there any picture which would show how the zipper teeth lock together? NASA Johnson Space Center Oral History Project has an interview with Larry E. Bell. This provides some detail of the history of the zippers and also about the doubts regarding these. I still find it fascinating that the Apollo exploration relied on these. I guess this was a factor being addressed here regarding the cancellation of Apollo 18 at the moment. 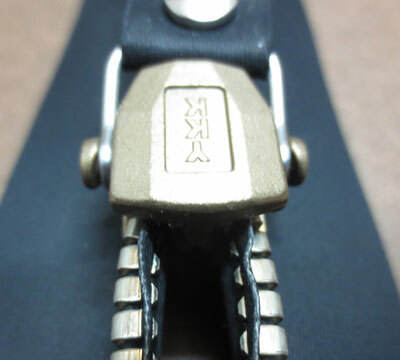 The zipper teeth on the BDM (YKK) zippers are the small rectangular tabs you see on the inside edge of the zipper. They don't stick out much and are almost flush with the rubber surface. 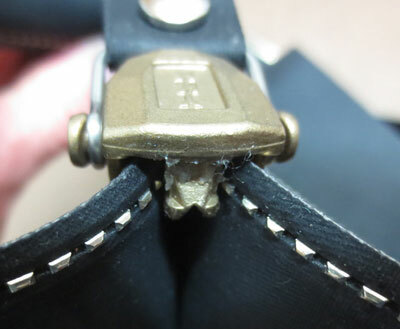 The flat curved metallic bands on the outside of the zipper clamp the zipper teeth in a fold of the zipper rubber that runs the length of the zipper. The interlocking teeth are rectangular shaped "knobs" or "hammer heads" that are guided to interlock with the teeth from the opposite side by the slider as it pulls the zipper halves together. As the zipper slider is pulled it brings together each side of the zipper rubber which is the up-turned edge of the flat zipper rubber. The pressure seal is between the faces of the up-turned zipper rubber which are pressed together by the interlocking of the zipper teeth. This is why the closed zipper has a high ridge running down the middle when the zipper is closed. Thanks a lot! The drawing is essential. And what about the BF Goodrich zipper end, how the pull tab was sealed, could you make some drawing of it? The Goodrich pressure sealing zipper works by forcing two wedge shaped lip seals together, with one over lapping the other. The interlocked zipper teeth hold the lip seals together. The sealing side of the zipper is on the inside of the suit so suit pressure also works to help hold the seal closed. See the diagram. 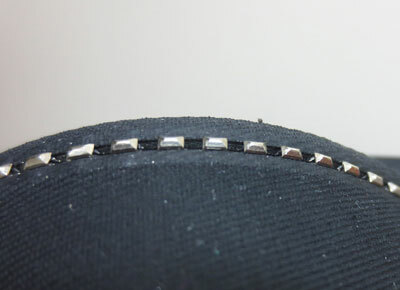 The end of the zipper is sealed by the slider which has an inner flange surface and an outer flange surface. The inner flange surface of the slider rides along the surface of the lip seal when the zipper is being closed. 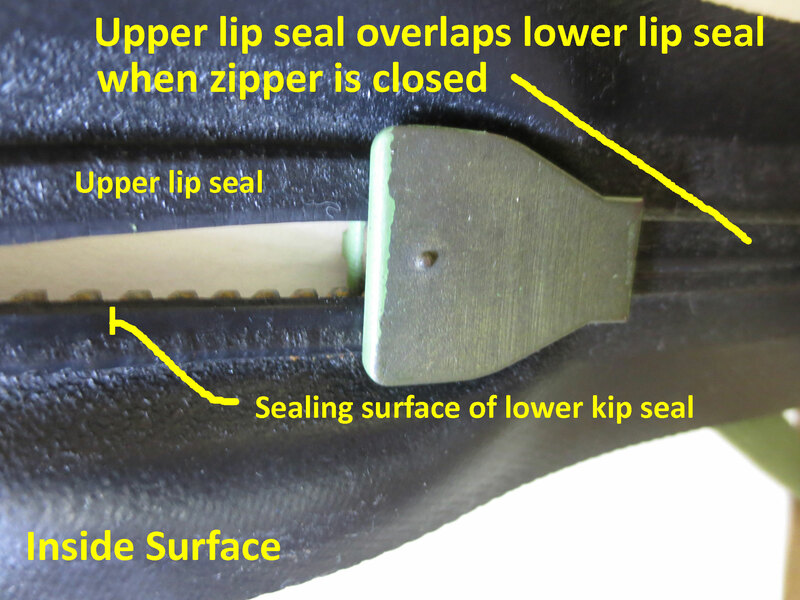 However, the lip seals cannot be brought together at the end of the zipper because the slider is in the way when the zipper is fully closed. So at the end of the zipper, the lip seals transition into a raised rubber ridge that runs around the end of the opening of the zipper. 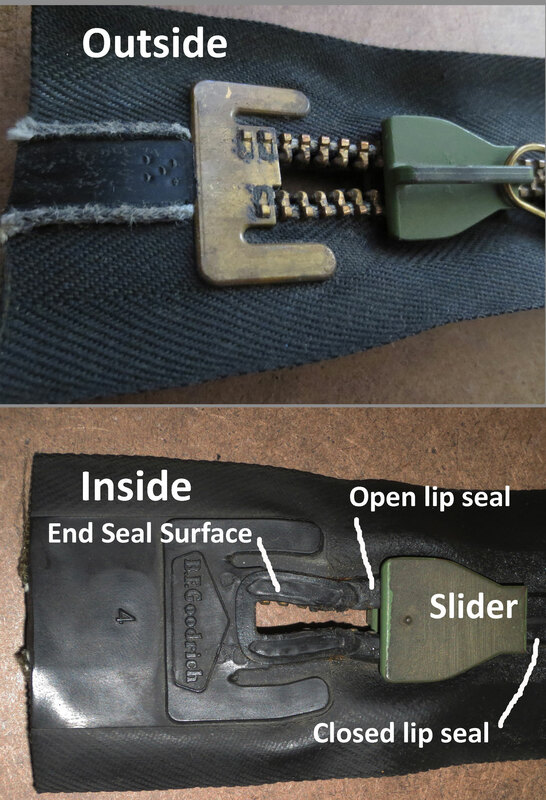 As the zipper slider is pulled to the end of the zipper, the inside flange of the slider rides up over the raised rubber ridge, compressing the ridge, and making a seal against the inner flange of the slider. Thus the slider itself becomes part of the pressure seal when the zipper is fully closed. I hope the details in the following pictures help clarify this. 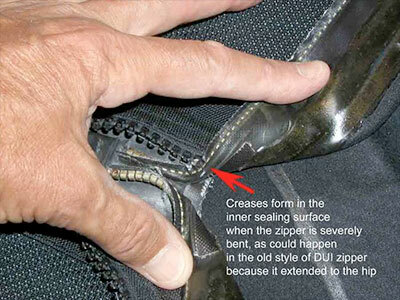 On some suits a separate or additional load carrying zipper is added to help carry the load across the zipper. On the Apollo A7L suit this non-sealing zipper is located on the inside of the suit. It is zipped up first, to pull the suit opening closed. It is slightly shorter than the outer pressure sealing zipper. The BFG pressure sealing zipper is then zipped closed and its lanyard secured to the suit with a snap. The use of an internal mechanical non-sealing zipper on the A7L also helps reduce the possibility of damage to the rather small and fragile sealing surface of the lip seals on the BFG pressure sealing zipper, since the suit opening is already pulled together by the internal zipper, when the pressure sealing zipper is zipped closed. Great! I had to change my wrong idea how does this work. I supposed that those two zippers are equivalent, and that they press a flat rubber sealing lips from two sides. Now I understand, that the inner zipper is just supporting and its red strap had to stay inside. But anyway, I would fear if my life depended on this. Seems to me that simpler system of the Russian spacesuit is more failproof. All zippers are non-airtight, the entrance "sleeve" is folded and wrapped around. I have always believed that the pressure sealing zipper was on the pressure layer of the suit and a load pressure was on the restraint layer? And there was not the restraint layer. Unless the second zipper (zipper load) is also on the pressure layer. Argh... my head Help me, please. You have faith in a rubber tie on the neck of a "Baggie™" to be more secure on a suit that has never seen a vacuum operationally vs a suit design that has been used by 27 individuals on actual EVAs. Torso Limb Suit Assemblies (TLSA) had itself both functions of restrain layer (in the sense of "the layer to prevent the bladder from ballooning") and pressure layer. See: Apollo Suit Convolutes. 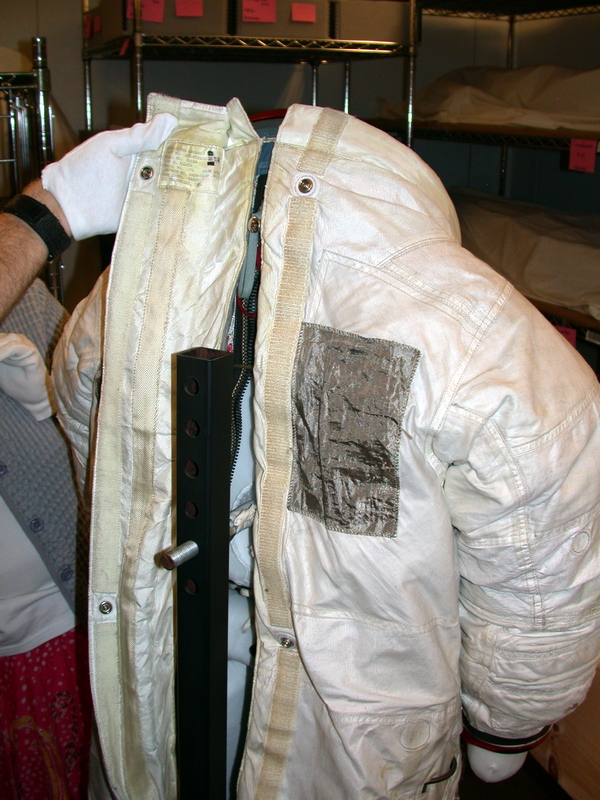 The Integrated Thermal Micrometeoroid Garment (ITMG - the white outer layer) could not bear the pressure load with its Velcro fasteners. The A7L spacesuit had one BF Goodrich pressure sealing zipper which ran down the back of the suit and thru the crotch up to the lower abdomen. Blue strap, the outer one on the pressure layer (i.e. the TLSA). A separate regular heavy duty zipper was used over the pressure sealing zipper to help carry the pressure induced loads on the sealing zipper but was not part of the pressure sealing zipper. Red strap, the inner one on the pressure layer (i.e. the TLSA). You have faith in... a suit that has never seen a vacuum operationally vs a suit design that has been used by 27 individuals on actual EVAs. Yes, I know, it's a paradox. Because the Russian system is so easy to understand. But do not forget, I was talking about A7L suit and its "BF Goodrich pressure sealing zipper." So some six individuals on 10 EVAs. From the Apollo 15 the spacesuit A7LB used different pressure zipper. So I suppose the original solution was not absolutely perfect. Torso Limb Suit Assemblies (TLSA) had itself both functions of restrain layer (in the sense of "the layer to prevent the bladder from ballooning") and pressure layer. Yes, because when I first saw the Russian system I thought that I would not trust it. While the bladder and restraint layer are separate pieces of fabric, on the A7L suit the restraint layer and the bladder with the pressure sealing zipper are attached (sewn and glued) together at the zipper. On the A7L suit the extra restraint zipper is not sewn directly to the restraint layer but is actually sewn to the inner surface of the pressure bladder along with the pressure sealing zipper. The bladder assembly is sewn to the restraint layer around the zippers. 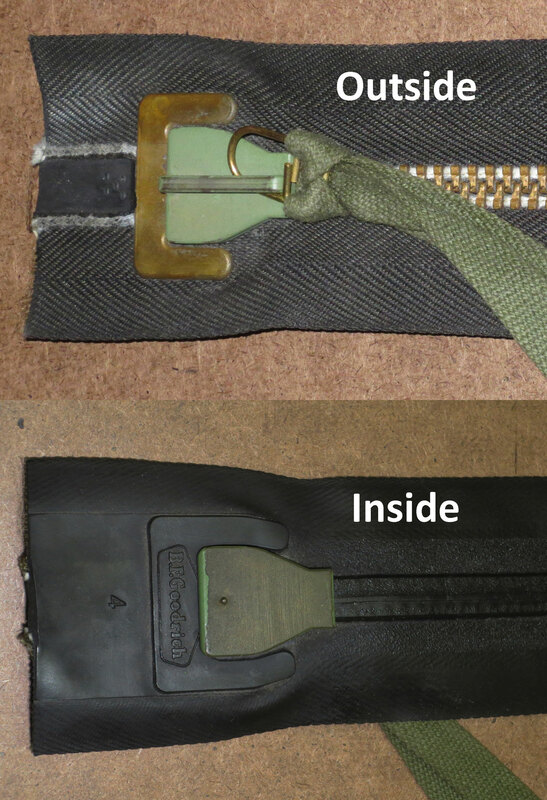 The A7LB used a different sealing zipper not because the BFG zipper was unreliable in any way, but because the zipper had to bend laterally (sideways) upward across the front of the suit. The BFG zippers do not lend themselves to sideways bending since they are wide and flat. Whereas the YKK zippers will bend sideways if the sides of the zipper flat rubber is not constrained (i.e. not sewn to the restraint layer). The reason for the difference between the A7LB and the A7L was the need to sit upright in the lunar rover. So they needed to add a waist joint to sit upright and then a neck joint to allow the head to tilt forward so the could look ahead and not up at an angle since the backs of the rover seats were at an angle and not vertical. The waist joint meant rerouting the zipper. Some trivia here - Also note that the nice suit image that bflmpsvz posted of what looks like an A7L is in fact the CMP version of the A7LB suit. It has the same zipper configuration as the A7L. Early A7LB CMP suits were converted A7L CDR and LMP suits with the hole for the water connector plugged (as with this suit. Later (newly built) A7LB CMP suits were made without the hole for the water connector. The Russian tie closure approach is simple but leaves a very large folded bunch of rubberized fabric pressing against the stomach area when the suit is pressurized. It can be very uncomfortable. The reliability of the Russian closure is not built into the closure itself but relies on the skill of the suit tech tying up the bladder for closure, which can vary. Also folding and unfolding rubberized fabric can degrade the fabric coating in the areas of the folds causing leaks to appear. 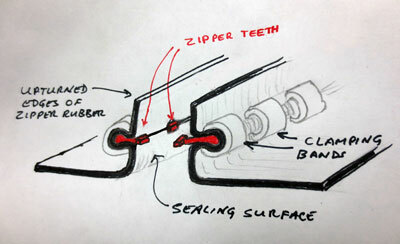 Thus the reliability of the Russian suit closure is not as reliable as a tested and qualified pressure sealing zipper. The reliability of the Russian closure is not built into the closure itself but relies on the skill of the suit tech tying up the bladder for closure, which can vary. There isn't a suit tech on orbit to help donning the suit for entry. 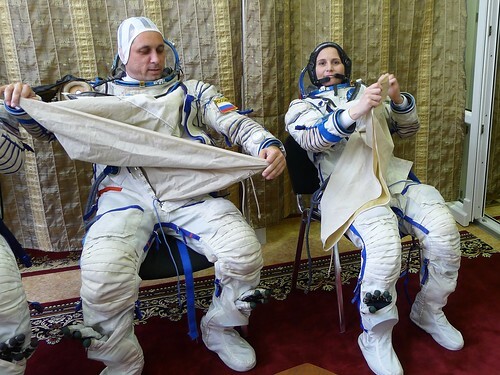 I suspect that the people trained to fly in spacecraft wearing the Russian spacesuits may undergo some training on how to operate the suits and how to assist each other in the donning of the suits. They may not be qualified as suit techs, Also I quest the do some type of leak check. Jim, good point. I should have said "person" instead of suit tech. The person wearing the suit has to close it up on orbit prior to re-entry. Of course that is for IVA use. As everyone knows, for their EVA operations they now use the hard shell uppper torso with door. A much more repeatable process than tying up a rubber bag. Knowing normally that the black boot (pressurization layer) is an integral part of the PGA, how do the engineers (in the picture below) do them to carry out a pressurization test (A7LB boot)? Perhaps this happens before the final assembly of the bladder?